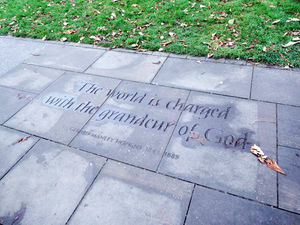 In 2011, as part of a plan to enhance the landscape setting of Exeter Cathedral, paving stones carved with inscriptions were set in the entrances to the Cathedral Green. In their talk, Sally Hollings and Prue Nichols will consider these inscriptions, describe how they came to be chosen, and look at the poems from which they were drawn and the poets who wrote them. An interesting and varied anthology emerges! DA members £2, non-members £3. Ample tea, coffee and biscuits are provided. Parking, behind the church, is free. See a flyer for the event here. Gerard Manley Hopkins in the Cathedral Yard. A short illustrated report of the event has been posted on our Facebook page, here.